household structure (e.g., marital and family status, household size). The following description of consumer travel to power retail and enclosed malls during a typical weekday in the fall stresses auto-driver (single-occupancy-vehicle) trips. The differences between shopping rates on weekdays and on weekends cannot be examined using the TTS. Research also suggests the presence of some variation in shopping across weekdays (Kahn and Schmittlein, 1989). The results of this study will, however, provide a profile of typical weekday travel to power retail and enclosed malls. Moreover, recent research suggesting that a person who owns a car will use it for all travel -- particularly if that person lives in a "suburban-style" setting (see Turcotte, 2008) -- provides sufficient rationale for studying peak periods in power retail shopping travel across the region. The "peaking" of consumer travel for power retail and enclosed mall shopping across the GTA is demonstrated here by plotting the distribution of trip start-times for trips originating from home (Figure 12) and trips from all origins (Figure 13). Shopping trips have been disaggregated further by mode (all modes vs. auto driver mode), retail format at the destination (power centre vs. enclosed mall) and trip purpose (work or work-related vs. shopping). The work-travel observations have been adjusted downward by a factor of 10 to facilitate visual comparison of the results (since peak-period work trips vastly exceed shopping trips). Differences between the results for work trips and shopping trips are likely exaggerated due to the underreporting of discretionary trips in the TTS. Several observations can be drawn from the trip time distributions for shopping trips starting from home. The a.m. and p.m. peak periods in shopping travel typically occur outside the peak periods of travel for work or work-related purposes. These shopping peak periods occur in mid-morning (10:00?11:30 a.m.), mid-afternoon (1:00?3:00 p.m.), and early evening (7:00-9:00 p.m.). In 1996, travel to zones with power retail peaked at 11:30 a.m. (71 percent auto-driver) and 7:30 p.m. (64 percent auto-driver). In 2001, travel to power retail peaked at 10:30 a.m. (74 percent auto-driver), 1:30 p.m. (70 percent auto-driver), and 7:30 p.m. (68 percent auto-driver). In 1996, travel to enclosed malls peaked at 10:30 a.m. (64 percent auto-driver), 1:30 p.m. (64 percent auto-driver), and 7:30 p.m. (60 percent auto-driver). In 2001, travel to enclosed malls peaked at 10:30 a.m. (68 percent auto-driver), 2:30 p.m. (63 percent auto-driver), and 7:30 p.m. (61 percent auto-driver). There was also evidence in 2001 of a mini-peak at 4:30 p.m. (58 percent auto-driver). While most trips to enclosed malls are taken by car, when compared with the power centre curves, the gap between "All modes" and "Auto Driver" indicates greater use of other modes (e.g., transit, auto-passenger, etc.). Most weekday shopping trips, to either format, occur after the afternoon peak commuting period. Examining these processes without further disaggregation by origin (i.e., trips originating from home or from another location) provides additional insight into the timing of consumer-retail interactions in the study area. Overall, there appears to be a relatively sustained level of shopping activity throughout the day. The a.m. and p.m. peak periods in shopping travel typically occur outside peak periods of travel for work or work-related purposes. These periods can be characterized as mid-morning (10:00?11:30 a.m.), mid-afternoon (12:30?3:00 p.m.), and post-work evening (7:00-9:00 p.m.). In 1996, peak period travel to zones with power retail occurred at 11:30 a.m. (74 percent auto-driver) and 7:30 p.m. (65 percent auto-driver). In 2001, peak period travel to power retail occurred at 11:30 a.m. (76 percent auto-driver); 1:30 p.m. (75 percent auto-driver); and 7:30 p.m. (68 percent auto-driver). In 1996, peak period travel to enclosed malls occurred at 11:30 a.m. (66 percent auto-driver); 2:30 p.m. (63 percent auto-driver); and 7:30 p.m. (61 percent auto-driver). In 2001, peak period travel to enclosed malls occurred at 11:30 a.m. (79 percent auto-driver); 2:30 p.m. (66 percent auto-driver); and 7:30 p.m. (61 percent auto-driver). Beginning at around 9:00 a.m., there appears to be a rising and then sustained level of shopping activity throughout the day, that starts to decline at around 8:00 p.m. An increase in shopping during the post-work evening peak period is evident. For all times of day, more trips end at zones containing enclosed malls than in zones containing retail power centres. The timing of shopping trips to power centres or enclosed malls appears similar. However, there is some evidence of a more sustained peak period in power retail shopping in comparison with the peak in shopping trips to zones with enclosed malls. The data reflect trip start-times for a typical weekday in the fall. The number of work trips has been rescaled (adjusted downward by a factor of 10) to allow for the comparison of the location of the peak-periods associated with travel for work and work-related purposes versus shopping. The data reflect trip start-time distributions for a typical weekday in the fall. The number of work trips has been rescaled (adjusted downward by a factor of 10) to allow for comparisons of the location of the peak periods associated with travel for work and work-related purposes versus shopping. The timing of shopping travel described above gives rise to four key observations. 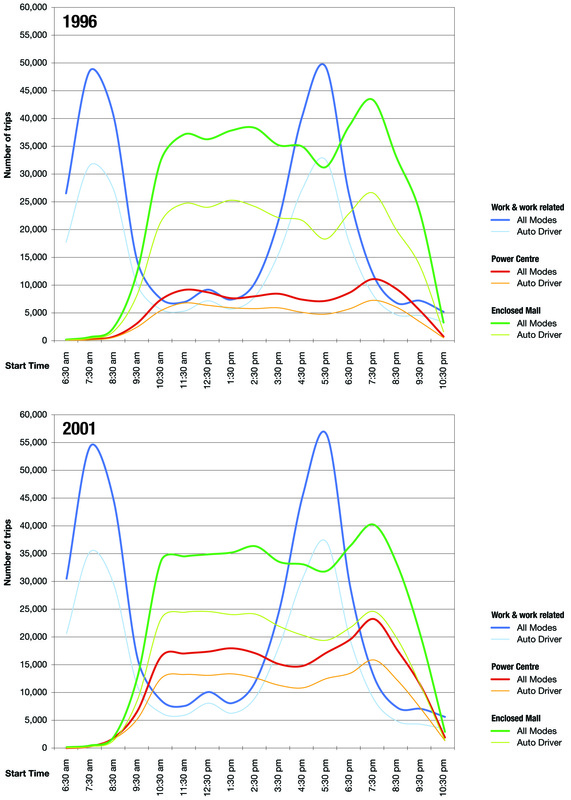 First, there is evidence of increasing automobile use for shopping in all peak periods and for both retail formats. The only exception to this rise in automobile use appears to be the p.m. peak for enclosed malls (61 percent of trips in 1996 and 2001). 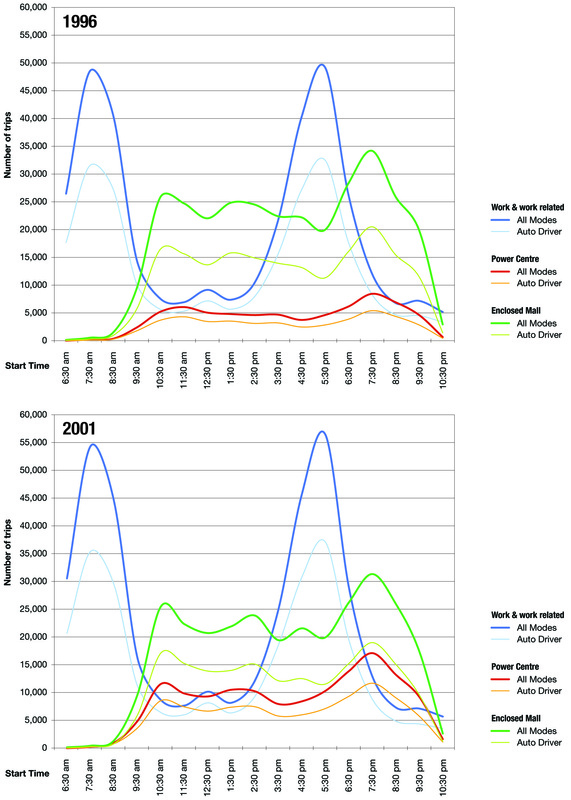 The data suggest that the largest change in automobile use occurred during the a.m. peak for enclosed malls (66 percent to 79 percent auto-driver). Evidence for rising levels of automobile use suggest that the proliferation of the auto-dependent power retail format is being matched with an increase in automobile use for travel to enclosed malls. Second, more automobile trips are taken to enclosed malls throughout the day than to retail power centres. The enclosed mall has retained an important role in weekday shopping and the automobile is the primary mode of travel to these locations, despite the differences in the supply of transport alternatives that may partially distinguish the enclosed mall from power retail. In 2001, for example, auto-driver and passenger trips accounted for 88 percent of trips from home to zones with enclosed malls, while transit captured roughly 11 percent of these trips.16 In contrast, auto-driver and auto-passenger travel to power centres during the same time period captured 96 percent of the market. Differences in automobile use across format types are to be expected, given the way in which power centres are laid out and their lack of pedestrian facilities. Moreover, it is important to consider the historical record. The first wave of suburban retail in the GTA was developed with transit in mind (early super-regional suburban malls were developed in the City of Toronto with direct links to transit), and indeed, the availability of transit was an integral component of the development of most early large-scale shopping destinations across North America (e.g., Bartlett, 2003). Developers of more recent, much larger retail locations, however, typically cater to consumers who arrive by automobile. Third, the data indicate some changes in the scheduling of shopping trips between 1996 and 2001. The peak in power retail shopping trips starting from home has shifted from 11:30 a.m. in 1996, to 10:30 a.m. in 2001. Moreover, by 2001 the mid-afternoon peak in shopping trips to zones with enclosed malls was partly matched by the emergence of a mid-afternoon peak in power retail travel. Fourth, the p.m. period overlap of the work and shopping trip start-time distributions shown in Figures 12 and 13 indicates greater competition for road capacity across work and shopping trips in the p.m. period than during the a.m. peak period in commuting. While it is obviously not possible in this analysis to identify the specific places in the passenger transportation system where the greatest competition for road space occurs, there is more activity within the transportation system during the afternoon peak period (for shopping, work, and the movement of goods), which may produce higher levels of congestion and longer travel times. The qualities of convenience, price, and auto-oriented accessibility (e.g., Jones and Doucet, 2000) of power retail appear to be prompting a consumer response in the timing of shopping trips. While there is some overlap in the trip start-time distributions, GTA consumers appear to organize most shopping trips outside the peak periods of work-related travel, thereby partially avoiding the most congested times of day on the GTA's roads. The demand for shopping may be more sensitive to trip duration; consumers may respond by scheduling shopping, particular discretionary shopping trips, at periods of the day when congestion is lower. Moreover, hours of work constrain the scheduling of weekday shopping, pushing demand for travel of this sort into the non-work time periods. Research conducted elsewhere also suggests that people working outside the home are more likely to drive to shopping during the post-work period than others, and that women are more likely to shop during the a.m. and p.m. off-peak times than men (Bhat, 1998). Understanding who is doing the shopping and developing policies to balance the needs and preferences of shoppers against sustainability goals for the region are important directions for future research. From a planning, policy, and research perspective, it will become increasingly important to broaden current thinking on the determinants, decision processes, and outcomes (e.g., mode choice and externalities) associated with peak periods in shopping travel. Additional research is required to understand how, when, and why consumers in the Greater Golden Horseshoe Area visit enclosed malls and power retail centres and how policies to reduce auto-dependence might be received by different segments of the population, given differences in household responsibilities, labour market participation, and preferences for goods and services. Additionally, and following the amendments to the Retail Business Holidays Act in 1992 that permitted Sunday shopping in Ontario, there is a strong case to be made for extending analysis of this sort into the weekend. National-level data suggest that the weekend days of the employed labour force (paid workers 25 years and older) are characterized by peaks in shopping at around 11:00 a.m., with the afternoon and evening given over to leisure activities (Silver and Compton, 2002). Not as much shopping occurs on Sundays as on Saturdays, and the late afternoon peak in Saturday shopping (3:00 p.m. to 3:30 p.m.) does not materialize on Sundays (Silver and Compton, 2002). While region-wide travel survey data for weekends are not available for the study area, recent analysis of detailed individual-level data for the GTA suggests that the geography of weekend travel demand can be highly variable, and quite different from weekdays (Buliung et al., 2008). The growth of the service economy and the retail sector in particular also means that work, leisure, and shopping travel demand likely compete for road use on weekends. The location of weekend congestion and the development of weekend policies to affect patterns of weekend travel demand require some attention from researchers and practitioners. 15. Of course, some people are at certain times simultaneously "shoppers" and "workers" -- i.e., individuals who participate in both activities while travelling, at either end of the work trip, or at some point during the trip.